Buddy brought three more friends with him during the summer of 2008. The first one was this gorgeous mackerel patterned girl kitty we named Pippie, short for Pipsqueak, or my Pippie Pipkins, the Pipkin Pipsters. She was the quirkiest cat-she really did some odd things. She loved attention, though, and was a very loving cat. 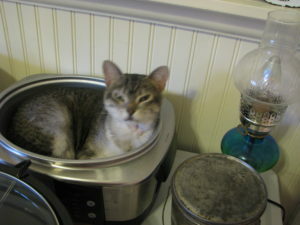 She also loved to curl up into anything she could fit into-serving bowls, empty boxes, the Crock-Pot. Sadly, Pippie got cancer and went to Rainbow Bridge on Christmas Day 2014.